Skunks are among the most widely distributed mammals in North America. The striped skunk (Mephitis mephitis) is found throughout the United States and parts of Canada. Skunks are readily recognized by their black and white pelage pattern and their unique, odorous musk which they use for defense against predators. Skunks are omnivores and feed on a wide variety of plant and animal material. Their diet includes berries, fruits, vegetables, insects, small rodents, reptiles, eggs and young birds. The striped skunk has short, stocky legs and is about the size of a house cat. They have two broad white stripes running the length of their jet black body from the nape of the neck to the base of the tail. A single white stripe separates the eyes and the long bushy tail is tipped in white. Adult striped skunks can weigh up to 10 pounds. Skunks are highly adaptable. They frequently live in close association with humans. Although skunks are commonly considered a nuisance, their tendency to consume insects and rodent harmful to agriculture crops may benefit farmers. Unfortunately, these same activities can also create additional damage situations. Skunks eat the eggs and young of ground nesting birds. Skunks may also damage vegetable gardens, kill and eat domestic poultry and their eggs. Occasionally they may damage beehives whiles trying to feed on the bees. Skunks disrupt unsecured garbage cans and consume pet food that is left outdoors. They may also damage lawns, athletic fields, and golf courses by digging up turf as they search for food. Skunk denning activities can also result in damage. Dens located under buildings can be a nuisance to building occupants should the skunk release its musk. Lastly, skunks can also be a major disease factor. In many states skunks are the primary wildlife carrier of rabies. They may also be infected with tularemia, distemper, Aleutians disease and several parasites including fleas, lice, mites, ticks, roundworms, tapeworms, and flatworms. Skunks mate in late February to early March. Average gestation period is 62 to 66 days. Skunk kits are born from early May to early June. Litter sizes can range from 2 to 10. Kits are born blind and thinly furred. Their eyes open in 17 to 21 days, and by 2 to 4 weeks of age, the kits are available to expel musk from their glands. They begin to hunt with their mother at about 2 months of age. Until then, they are left alone in the den when the mother goes out hunting. The kits remain with their mother until autumn. Skunks are solitary animals. They come together only during breeding season and during winter when several may be found denning together. Although skunks do not hibernate, they may become inactive for extended periods during the winter. Skunks are characterized as being shy, secretive animals. They discharge their scent when disturbed, cornered, or harassed. 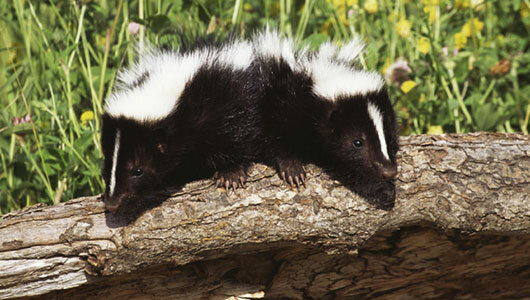 Prior to releasing scent, the skunk often will stamp its forefeet rapidly while lifting its plume over its back. If you are confronted by a skunk and this behavior is noticed, retreat slowly from the area and avoid making any loud noises or aggressive motions. A skunk has the ability to direct the musk to either side, in back of, or in front of its body, by alternating the direction of the protractile glands. The fluid may be expelled a distance of 8 to 15 feet, with a mist going even farther. Skunks are primarily nocturnal, but may at times be sen in early morning or late afternoon while searching for food. Their normal home range is from ½ to 1-1/2 square miles. During the breeding period, males may wander 4 to 5 miles at night. Skunk damage to turf can be identified by small 3 to 4 inch cone-shaped holes in the ground or by small patches of exposed earth. Turf damage may be reduced by using an insecticide to eliminate grub populations. Use those insecticides which are rated as having low toxicity to wildlife. Brush piles, open irrigation pipes, and junk cars offer shelter to skunks. The presence of these human-altered habitats may encourage use of an area by skunks. Storage areas, sheds and garbage which provide food sources may also attract skunks. Eliminating potential den sites and food sources from an area is an essential step in long-term reduction of skunk numbers. Feeding of dogs or cats on a deck or porch is a sure way to attract skunks. Skunks can be excluded from denning under buildings that lack concrete basements or foundations by sealing all holes with fine wire mesh. A 2 foot wire mesh with the bottom 6 inches bent out at a 90 degree angle and buried at a depth of 6 inches will prevent skunks from digging underneath buildings. Skunks that become established under buildings have been removed by using chemical repellents, trapping and exclusion techniques. Some vertebrate pest control officials have had success repelling skunks from under buildings by placing mothballs, naphthalene flakes, or paradichlorobenzene crystals in the areas being used as den sites. Rags soaked with cleaning solutions of bleach or ammonia have also been reported to be effective repellents. To determine if a skunk is still using an area, seal all possible openings except for the main entrance. Flour, or some similar material that will record tracks, should then be spread out on the ground in front of the main entrance. After dark, examine the site for tracks. If tracks are present and they indicate that the skunk has exited, immediately close the opening. If no tracks are present, return in an hour to re-examine the site. If there are still no tracks, continue to observe the site for several days. If no tracks are observed over this time period the entrance can be sealed.